The highly talented Barthelona (pictured) extended his perfect record at on Saturday when winning the Telstra Supports The Alfred Foundation Plate at Caulfield over 1100m – making it a winning double for the Ballymore team. Barthelona was eased to the tail end of the field, after drawing the widest barrier, and looked to have settled nicely for rider Ryan Maloney. The three-year-old colt by Zoffany only had one behind him heading into the straight before unleashing a devastating turn of foot over the closing stages to score by a long head. Trainer Mike Moroney has always held the colt in high regards very early on, although following the race admitted he wasn’t quite sure how the horse would handle the soft ground. "I was a little bit worried about the track if it was too soft but he looks like he handled it ok,” Moroney said. 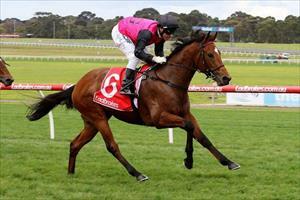 Barthelona has won his three starts and Moroney said he will look to step the son of Zoffany up in class. "We were lucky to get a run into him as a two-year-old and he’s the sort of horse that has just kept getting better,” Moroney said. Ryan Maloney has ridden Barthelona in all his races and said it was a good effort from the outside barrier. "He switches off and relaxes and then when you ask him he finds a lot for you,” Maloney said. Quality mare Alaskan Rose vindicated Moroney’s thoughts when producing a very tidy turn of foot to come from dead last at the 600m and swamp her rivals in the closing stages. “We’ve never doubted her class and I think all the travelling she endured in the Spring and Autumn has been the making of her,” Moroney said. Alaskan Rose will be aiming for one of the feature fillies and mares races at the latter end of the Spring carnival over 2000m.